When I woke up today, I really felt like I had to wear something slightly extraordinary - meaning different from the usual autumnal/winterly clothes - and spontaneously that awkward pink fake-fur piece caught my eye. I had bought it last year in the x-mas sale and couldn't decide whether I loved it or hated it from the very first minute. As it is so trashy, I simply had to pair it with my faux leather jacket, just to kinda give it the complete overkill. Haha. And now that I have worn it once - if only for a couple of minutes, though - I think it's stored well on my clothes rail waiting for the next theme party. How about you guys? Do you have any piece in your wardrobe you neither like nor want to give away? wow youu look amazing ! I also like how you've worked the overalls here. Außerdem stehe ich voll auf Latzhosen! Und das Kompliment zu den Haaren geb ich gern zurück! 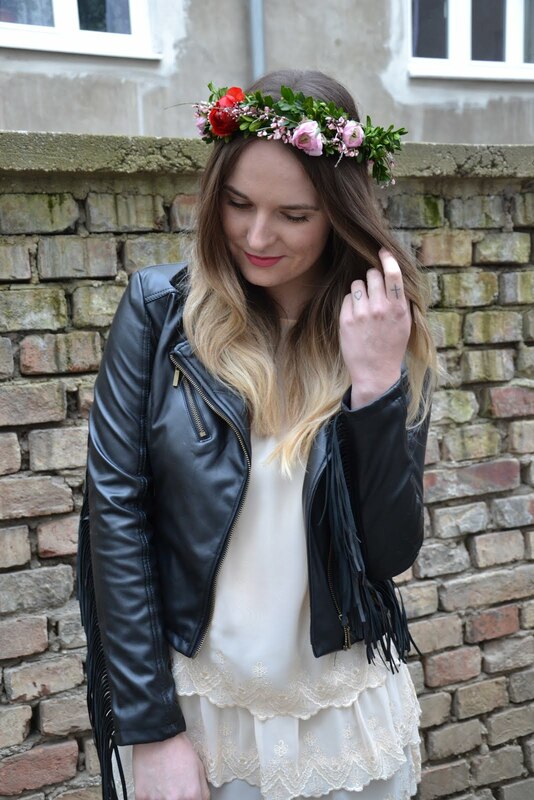 total tolles outfit und dein blog ist auch super! Das Outfit könnte echt eins aus den 90ern sein, auf einer Mottoparty wärste genau richtig- und versteh mich nicht falsch, ich liebe 90er Partys :D!! !